Add any Text to this sign! This custom wooden sign features a hot nose riding session, with classic red surfboard logo colors. Add your city, or local break to this sign. To add your custom text, simply write in the text box above. Wood sign will say your city with your state text underneath. 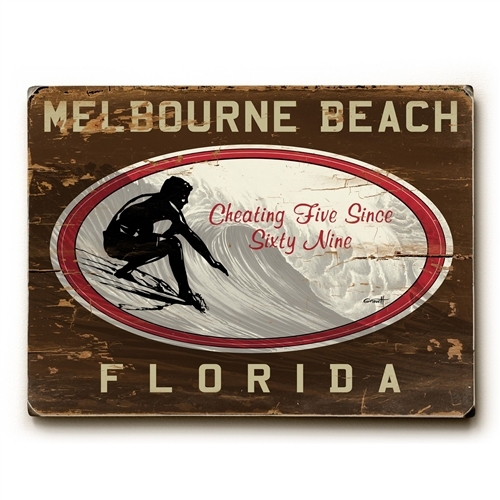 Great original beach sign for any beach house on the shore. These beach signs look great framed or simply hung up on your wall with some finished nails. Click beach sign image for a larger view. If you have any questions or concerns, please remember you can always phone us at (949) 370 - 6535 or chat online with one of our customer service reps.